Enjoy immediate warmth in the winter. Plug into standard 12V socket and within seconds experience warmth that spreads through your body. 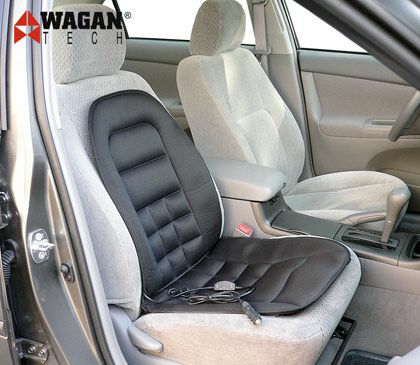 Heats lower back/lumbar area and bottom of vehicle seat cushions. Self Adjusting temperature control control switch. Made of soft cotton cover and quilted cushion. Elastic straps & hooks help to secure the cushion firmly to seat. Fused 12 Volt plug guards against overheating. Easily moved from car to car. Packs flat for travelers for use in rental cars, trucks, or airplanes.